Home » Blog » Computers » It’s World Backup Day. Know your options for backing up documents! It’s World Backup Day. Know your options for backing up documents! Today, March 31, is World Backup Day. That’s right, a whole day dedicating to getting the word out about backing up your documents from all of your devices — computers, phones, tablets, music players, and more. Here at B&T, we recommend that everybody backup their devices on a regular basis, because we don’t want anyone to be stuck without the documents they need should the worst happen. In 19 years in business, we’ve seen it all — hard drives develop bad sectors, phones lose power and never turn back on, or something is deleted by accident or due to a virus. We don’t believe in fear-mongering, but it is true that something bad can happen to your device at any time, and usually when it’s most inconvenient. So you want to be prepared before the time comes by making sure to backup all your documents. So what options do you have for backing up? A local backup of your data is always recommended, as you want to protect your data but have access to it quickly if a problem should arise. 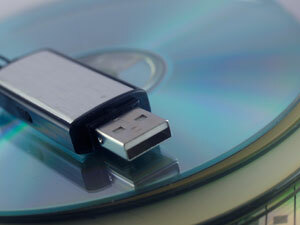 For computers, a flash drive is best if you have smaller amounts of information, and/or want it to be easily transportable. If you require more information to be stored, an external hard drive is recommended. Hard drives are not as easily transportable (they can’t hang off a keychain like a flashdrive), but a laptop-sized hard drive may be an option if you want the capacity to store more files, while desiring a smaller storage device. There are few disadvantages to backing up locally, and we highly recommend that you implement some system to do so. However, it is sometimes (though rarely) possible that a backup device, such as a hard drive, could also fail, even if it has not being used for some time. We recommend occasionally performing system checks on your backup device, just as you would on your main storage device, to check for possible bad spots on the drive. A remote backup gives an extra option for storing your files at an offsite location, especially in the event that the local source also fails or is lost. There are a plethora of free and subscriptions options to achieve this. Some, like Dropbox, Google Drive, Microsoft SkyDrive, or Apple iCloud, allow users to individually upload and/or sync files automatically; a few of the services will also snyc files from other devices, such as your phone. Other services, such as Backblaze, Carbonite, or Mozy, perform a whole-system backup, and may also continue to backup new files over time. The disadvantages to either way of remotely backing up mainly come from the ability of the company providing the service to stay in business. There is a risk that, should the backup company go out of business, that you will lose your remote backup entirely. We therefore recommend that you check into the current status and history of the company, especially before spending money on a subscription. Also, never make a remote backup your primary solution. As you can see, there are so many options for backing up your files that it doesn’t make sense, and isn’t worth the risk, to not do so. So what option should you choose? It all comes down to how much information you have stored, where you have it stored, and how secure you want to be. Both local and remote options have pros and cons, but it at least makes sense to make one local backup of your most important files, especially anything financial or legal-based. If you have any questions on choosing a backup solution, feel free to give us a call or stop into the store during business hours. We also sell the equipment to setup your local backup solution, including hard drives, hard drive enclosures, and flash drives. Finally, we also provide backup services, should you need extra assistance in securing your files. Disclaimer: B&T is not associated financially or otherwise with any of the remote backup solutions listed above, and cannot vouch for their reliability. Though all are legitimate backup solutions, please do research before using them, especially if you plan on upgrading to a subscription plan.